Nailtini : The Eday Group, Inc., was established in 2003 for one purpose -- to put great ideas into action. (Eday is the phonetic spelling of "idée," the French word for idea.) Since founder Michelle Toma Olson's background, not to mention her passion, is in beauty products, the company's first launch was Nailtini, the only line of nail lacquer developed to maximize the creativity of the user by "cocktailing" different shades. With its peerless performance, hip sensibility and clever, tongue-in-cheek attitude, Nailtini was an instant hit, so it was only fitting that Liptini followed. Stay tuned for more innovative launches, each one dedicated to putting a great idea into action and keeping the momentum going. Great ideas aren't limited to great products. The greatest idea of all is to give back to the community that supports us. The Eday Group, Inc., gives back in socially responsible ways, such as donating product to women's charities and service organizations. Nailtini and Liptini are about cocktails for nails and lips - the only cocktails you can safely overindulge in - not alcohol consumption. Spreading this message of responsibility by supporting anti-drunk-driving organizations is one way Eday can continue to give back and accomplish its goal of maintaining a social conscience. I received Cocktail Napkins (nail polish remover squares), Club Soda Fizz, a nail art striping brush, a nail art dotting brush, The Mini Bar Collection (Garden Party - a collaboration with Mad Men's costume designer, Janie Bryant) , and a Sparkle Topper (Sparkler). 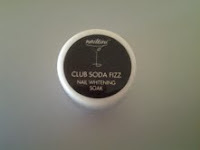 The Cocktail Napkins (love the name) are individual nail polish remover squares that are made to help condition your skin and nails unlike the cheap walmart $2.00 nail polish that dries my cuticles, smells horrible, and gets everywhere! it's a non-acetone formula with aloe. I was amazed how my fingers felt after using the products and the smell was pleasant they smell almost like lemons, and I didn't have my room smelling like gasoline after I was done. I only had to use a couple to remove even my stuck on glitter polish, I used front and back of a couple of napkins, and the polish removed without any fuss. I love this product! ♥. Club Soda Fizz I love this miracle in a bottle! I have been known to over work nail polishes and they end up staining my nails until it looks like I have a clear coat of yellow polish on my nails, I have soaked them in peroxide and it always ends up making my nails feel weird, and killing my cuticles to the point where I would rather have my nails be yellow. have you ever tried Club Soda Fizz before?.. The Club Soda Fizz really works! my nails were icky yellow. for some reason my camera wasn't showing the yellow in my nails so I decided to show you the after affect of the club soda fizz. As you can see in the picture, my nail tips are white, almost like a fresh french tip manicure. But the nails shown in the photo are of my real nails, white and clear. This is just a few minutes after soaking my nails in the Club Soda Fizz with luke warm water and a few minutes of soaking. No yellow, no painful cuticles and no dried out nails after soaking them in peroxide. Just healthy and natural nails. The (Garden Party - a collaboration with Mad Men's costume designer, Janie Bryant) The Mini Bar Collection (Garden Party - a collaboration with Mad Men's costume designer, Janie Bryant) was the second collection created for Nailtini. . Janie is the one responsible for all of Megan's youthful trends of the 60's (and who can forget Sally's dress and boots?) and Joan's bombshell outfits. This has to be one of my most favorite nail polish sets that I own so far. Admiral Perry is a royal blue it has a an amazing blue hue too it. The application was amazingly easy, it only took 2 coats to get the nail coated completely. This color is gorgeous alone, or mixed and matched with the nail art brush, and or dotting tool. (Pictures below) This would make any every day shopping trips fun, or a navy blue theme wedding or any other event such as a birthday party. Blue Carnation is a creamy soft blue polish that I love. I'm usually not into blues but I fell in love with this instantly. It only took a couple of coats to get a soft shimmer light coat, you can go darker for more of a drastic color. As you can see in my picture, as I stated above, you can use Admiral Perry as a nail art color, I know my lines look sloppy, but I literally did this in two seconds of sweeps with the nail brush. So if I can do this in seconds imagine what YOU could do in minutes, or even with lots of practice. The nail art tool, and spotting tool are now my favorite tools to use because they are fun, and so easy to use unlike other expensive tools I have bought. Blushing Lady I love the name of this nail polish!! is my all time favorite in this collection. Why?.. I'm a pink fanatic. Blushing lady is a delicate shimmery creamy pink, the polish was slightly more watery then I expected, so I had to really brush a few extra layers on my nail for the coating I prefer for pinks. But even tho it was watery, I didn't have any pooling issues and it was a little more easier to work with rather then thicker coatings of pink I own. I have experimented with this color by mixing, matching, and nail art and designs and this has become one of my most cherished pinks I own. Garden Jubilee is not a regular nail polish that I would throw in my shopping cart and speed to the checkout line. But after using this color It has opened my eyes to newer and well, different nail colors. What I would originally think was weird and I wouldn't pay a cent for, I have bought other colors I wouldn't originally go for. I fell for this color the second that it dried. The colors are different and has a pretty frosty, shimmery duo-chrome to it. The colors shimmer from a khaki mauve to a pretty espresso with every shift while keeping its pretty shimmer and glow. I only used a couple of coats. Sparkler is filled with bright pinkish/red and green glitter. Sparkler is like a party in a bottle. The first coat is a flirty sparkle, but if you keep adding its like a firework went off in your hand! this make a great forth of July nail polish or even a polish to pick up a dull mid-week, or to brighten up a little black dress at a dull business party, or to flare up a already fun dress for a weekend party. Which ever reason you decide to wear this stunning burst of fun, you will get a ton of compliments where ever you go. This is now my number one party in a bottle nail polish that I can't live without. 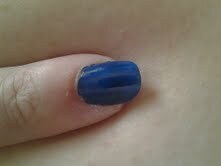 As shown in the photo I only used 2 coats to achive these stunning layers of gorgeous. This is a glitter polish that I recommend mixing with any fun color of choice. ♥ You can find Nailtini on facebook - Here. ♥ I receive no monetary compensation for this review. I was provided Nailtini to try and give my honest opinion.